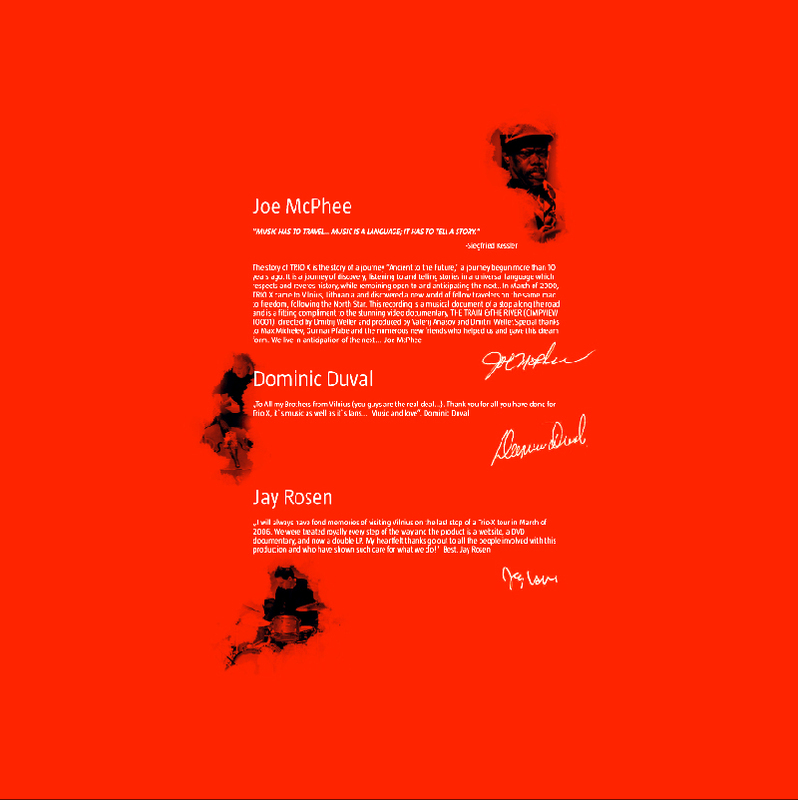 It’s been a decade since Trio X—reedman and cornetist Joe McPhee, drummer Jay Rosen and bassist Dominic Duval—released their debut, Watermelon Suite (CIMP, 1999). Though all three members of the trio are among the busiest improvising composers on the planet, that fact does nothing to diminish the empathy on which each Trio X recording is based. Their 2006 US tour was recently documented in a lavish seven-disc boxed set on CIMPoL. In March of that year, they toured Eastern Europe and in addition to a DVD documentary on CIMP, The Train and the River (2007), their concert in Vilnius, Lithuania at Konresu Rumai now gets the double-LP treatment from Lithuania’s No Business Records. 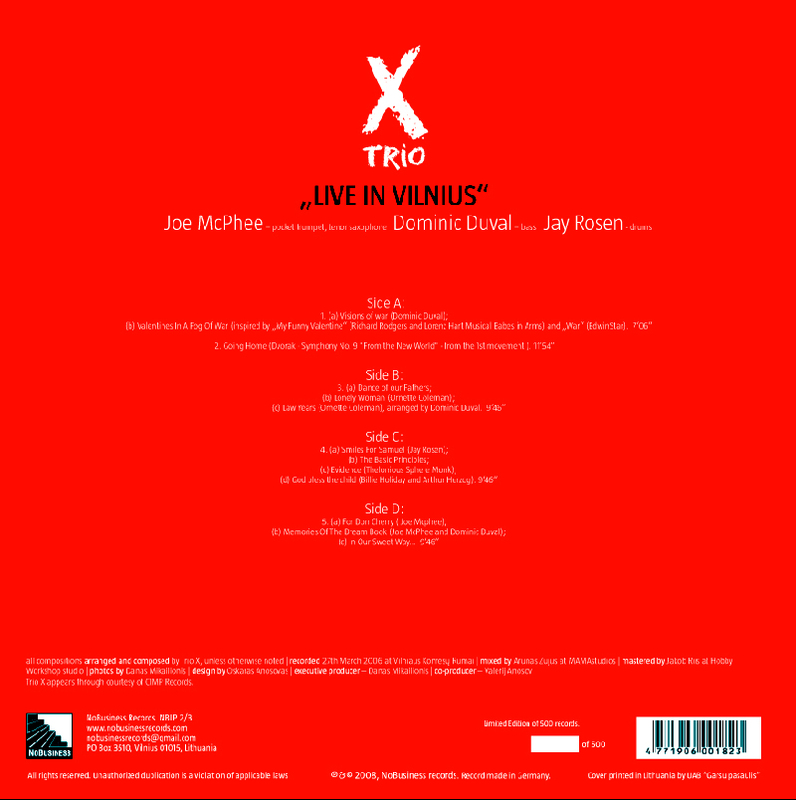 Live in Vilnius features McPhee mostly on tenor, with a few brittle daubs of cornet for good measure, as the trio engages long-form renditions of standards, Monk and Ornette Coleman tunes, and compositions by members of the group. Trio X is far more than power trio push-and-pull; rather, they extend the Gnostic “Y” of Albert Ayler’s Spiritual Unity (ESP, 1964) into realms both historical and contemporary. On the closing “Blue Monk,” McPhee purrs velvety and slick through the theme with touches of Coleman Hawkins and Gene Ammons, with Duval and Rosen providing a light and easy lope. Yet that Monkishness grows from a shattered display of metallic, split-tone peals and vocalizing through the horn, an eruption into muscular blowing over dry, snare-crack pulse. Husky, pathos-laden tenor fuels “Valentines in a Fog of War,” part of a suite that opens the first side (including the solo bass composition “Visions of War”), earthy detail from Rosen’s brushes a pattering accent on taut bass musculature and throaty, wide-vibrato lilt. An improvisation based on Dvorak’s 9th Symphony follows, entitled “Going Home,” which finds McPhee worrying a low blat and panning into high peals as Duval and Rosen approximate fast waltzes and a Spanish-tinged strum. The trio soon finds its way to the darkened corners of Coleman’s “Lonely Woman,” McPhee’s horn a hundred-years-old heartbreak climbing crystalline stairs in duet with the bassist’s busy pizzicato flecks. Seemingly returning to Dvorak, McPhee builds East European turns in his solo, a folksy bray here more angular than drawling. Clattering militaristic rites are paraphrased in battered pocket trumpet song, Rosen nearly disappearing as sawing arco provides a sinewy anchor. While Live in Vilnius is a vinyl-only production, housed in a deluxe gatefold sleeve and limited to 500 copies, it stands as a testament to Trio X’s total commitment to drawing from a wealth of sources, not to mention physical and spiritual communication. With several documents now available of Trio X’s 2006 tour, one can only hope they continue to build on experience and communion for another decade. So I am crazy, and enthusiastic. After having bought the “Trio X – 2006 US Tour”, a 7-CD box, the mailman yesterday brought me the double LP “Live In Vilnius”, also recorded in 2006, and issued in 500 numbered copies only (I got number 15, so I guess there must be some more copies available). Vilnius is the capital of Lithuania, one of the Baltic states in Europe, and one of the first releases by this brand-new jazz label, that also released two Mats Gustafsson albums so far, and that’s it. Quality over quantity, an excellent choice I would say, but I guess they must be a little crazy too, and probably even more enthusiastic. I had to get the dust of my turntable, try to get the weights and the speed right again, and lo-and-behold, great music emerged from my speakers. The album does have some of the same pieces as on many of their other live albums, including “Going Home”, “My Funny Valentine”, “Blue Monk”, “Evidence”, and it would have been a great addition to the box set in that respect. There are differences though. The sound quality is superb, the audience larger and more enthusiastic, which may have given the musicians an extra motivation, and … there is a ten minute version of “Lonely Woman”, that could already be heard on the DVD of this performance, albeit reduced to some ten seconds. And when I hear this performance, it makes up for the cost of the album and the shipment. It starts with McPhee on sax and Duval plucking his bass, heart-rending, bluesy, intense, intimate, deep, then with McPhee on pocket trumpet, Duval using his bow, gut-wrenching, soulful, wild, passionate, sad, then with McPhee back on tenor, crying, wailing, … it is majestic, awsome, bitter, unreal. Après avoir donné déjà une convaincante lecture d’Evidence, les musiciens en reviennent à Monk : Blue Monk éraillé mais en démontrant en guise de conclusion d’un concert d’exception aujourd’hui retenu sur les cinq cent exemplaires de Live in Vilnius.